The surfaces of the diamond knives are hydrophilic. 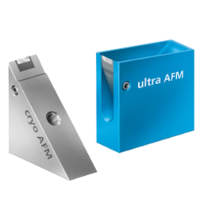 This property allows an easy wetting of the cutting edge, even with a very low water level (important for sectioning Lowicryls and other hydrophilic embedding media, as well as for water sensitive samples). Helpful in transferring your sections from the trough onto the grid without creases. 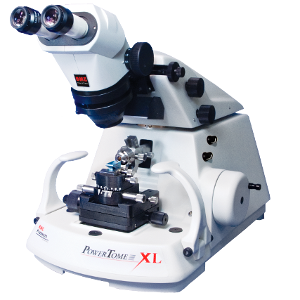 For the preparation of thin sections for electron microscopy the RMC line of ultramicrotomes has the longest pedigree in the industry. When they became a part of Boeckeler Instruments, a company with over 60 years experience manufacturing precision instruments, the stage was set for us to raise the bar on an already excellent product. Smooth . . . We designed a new cutting engine with exceptional levels of precision tolerance. This design reduces “play” between the parts of the engine to a minimum, virtually eliminating section chatter and susceptibility to external vibration.